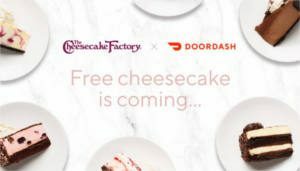 FRIENDLY REMINDER: DoorDash is partnering with The Cheesecake Factory to give away 40,000 slices of FREE cheesecake. This freebie is only available through the DoorDash app and website. The giveaway will start on Wednesday, December 5, starting at 11:30am PT. To claim the freebie, you’ll need to open up the DoorDash app on your mobile phone or desktop and add one slice of your favorite Cheesecake Factory cheesecake flavor (up to an $8.96 value) to your cart. Use promo code FREESLICE at checkout and your cheesecake will be on its way.